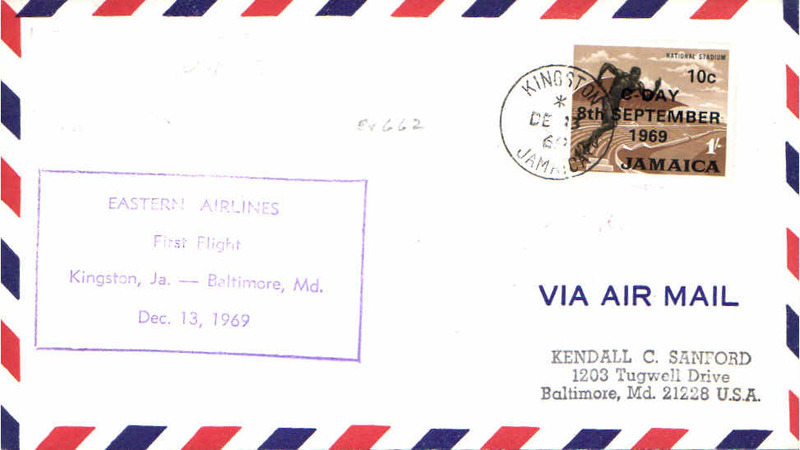 Pan Am FAM 5 F/F twice weekly Jamaica-Cuba express service, Kingston to Cuba, bs Miranda Oriente 10/2, plain cover franked KGV 9d canc Kingtn cds, large violet circular Type 5s Kingston cachet, b/s, violet on light blue etiq rated very scarce by Mair. 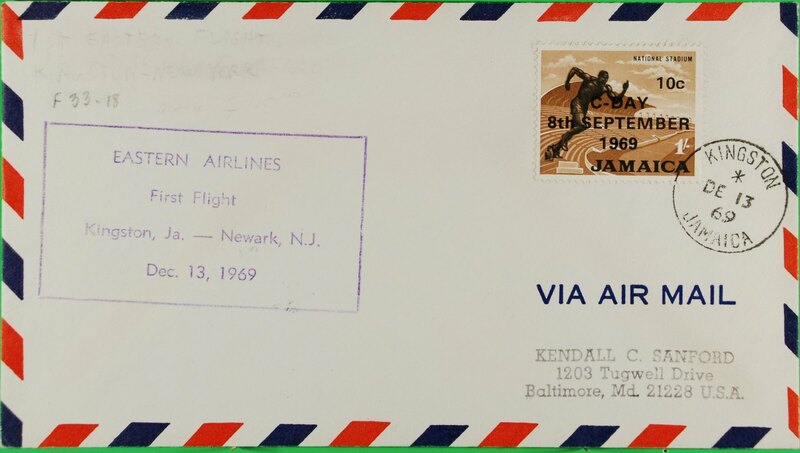 Pan Am FAM 5 Direct Flight Jamaica to St Lucia, bs 16/12, plain cover franked 1/5d, large violet circular F/F 'Jamaica-Miami USA' cachet, green on light blue etiquette rated scarce by Mair. Carried by Consolidated C16 flying boat. 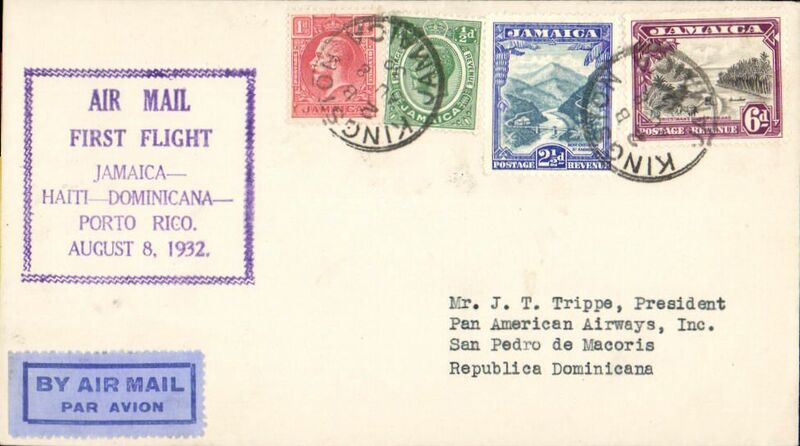 F/F FAM 6 Kingston to San Pedro de Macoris, plain cover franked 10d, violet framed official flight cachet, bs 9/8 and special arrival ds cachet on front, pale blue/dark blue etiquette, Pan Am. 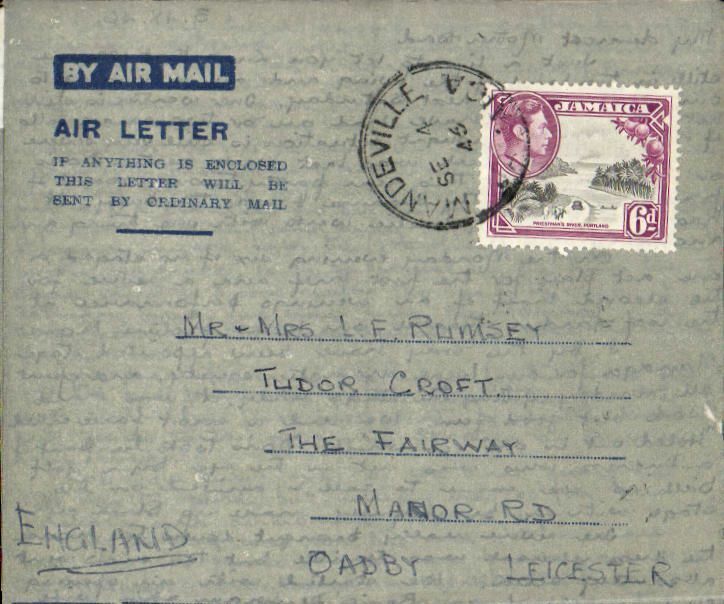 Pan Am F/F FAM 6 Kingston to Santo Domingo, bs 9/8,registered (label) cover franked1/-,canc Kington reg oval Aug 6 1932 ds, violet framed official flight cachet on front, and red special arrival ds diamond cachet verso, pale blue/dark blue etiquette. Signd by the pilot Capt.J.H.Tilton. 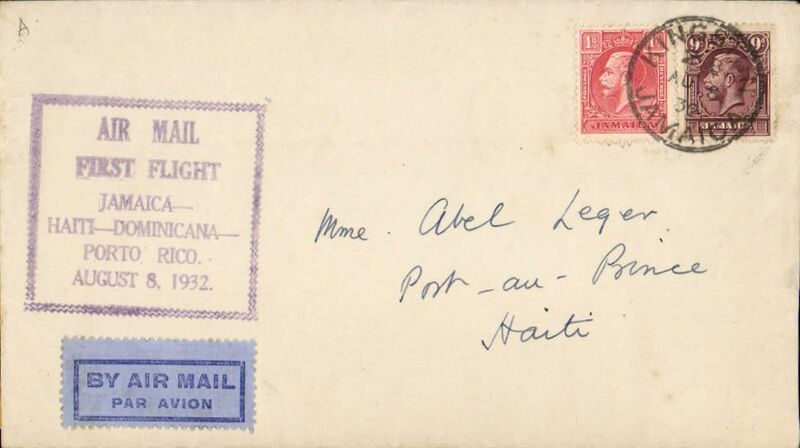 F/F FAM 6 Kingston to Haiti, bs Port au Prince 8/8, plain cover franked 10d, violet framed official flight cachet, pale blue/dark blue etiquette, Pan Am. 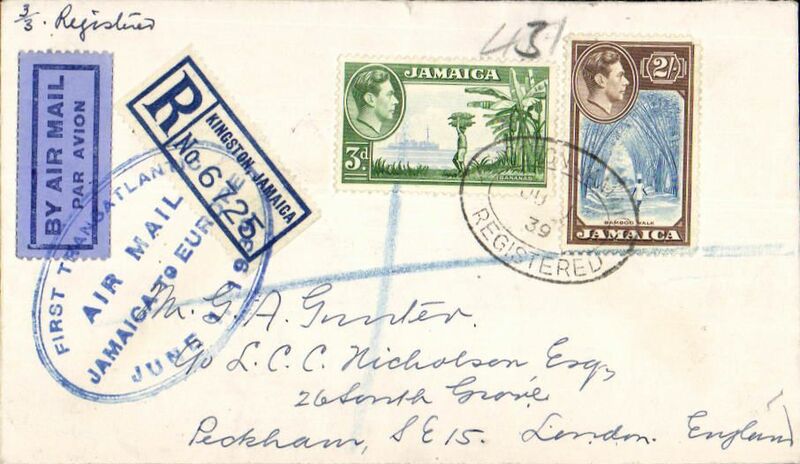 Early non philatelic airmail, Jamaica to UK, Kingston to Birmingham, bs 15/9, via Miami 8/9 and New York 9/9, registered (label) cover franked 1/2 1/2d, tied pale blue/dark blue airmail etiquette. Good routing. 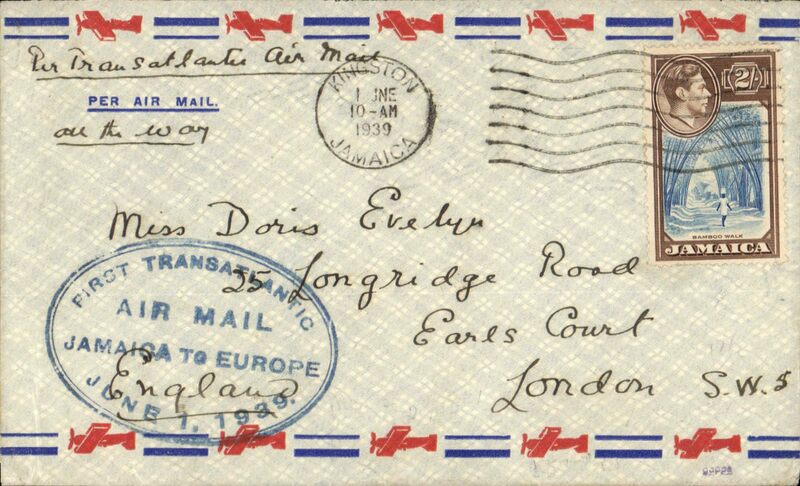 First acceptance of mail from Jamaica for the 'All Air' service to Europe, for carriage on the F/F FAM 18 Southern( North) Atlantic route, New York-Marseilles, airmail cover franked Jamaica 2/-, canc Kingston 1 Jne 1939 cds, ms "Per Trans Atlantic Air Mail/All the Way", official oval blue "First Transatlantic/Air Mail/Jamaica to Europe/June 1 1939". Jamaica dispatches were not accepted until June 1st. This particular cover is illustrated on p177 Bergier's "Relations Aeropostales Entre L'Europe et L'Amerique du Nord 1919-1945". Scarce. 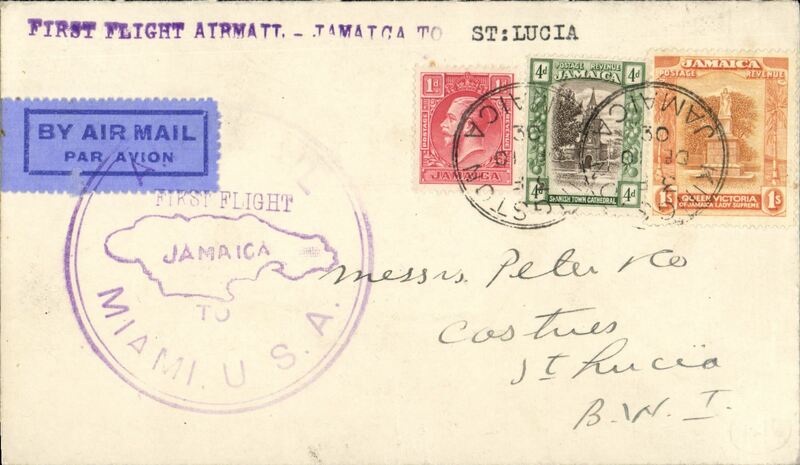 First acceptance of mail from Jamaica for the 'All Air' service to Europe, for carriage on the F/F FAM 18 Southern( North) Atlantic route, New York-Marseilles, registered (label) cover franked Jamaica 2/3d, canc weak Kingston, Jamaica registered oval postmark, official oval blue "First Transatlantic/Air Mail/Jamaica to Europe/June 1 1939" cachet tying blue/dark blue airmail etiquette. Jamaica dispatches were not accepted until June 1st. 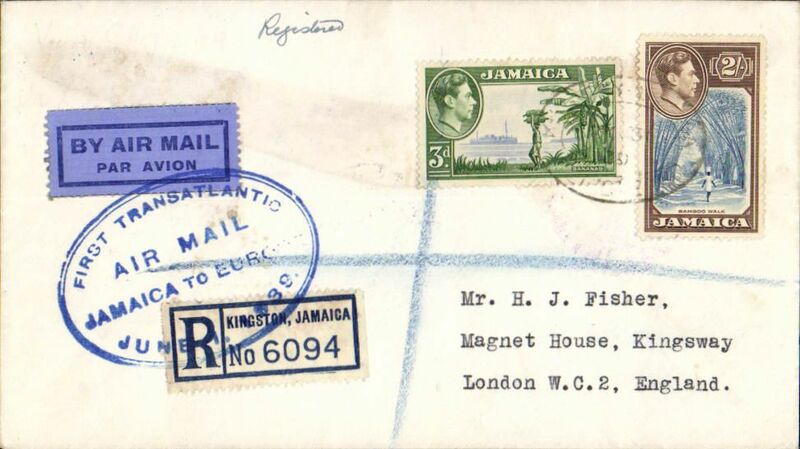 First acceptance of mail from Jamaica for the 'All Air' service to Europe, for carriage on the F/F FAM 18 Southern( North) Atlantic route, New York-Marseilles, registered (label) cover franked Jamaica 2/3d, canc Kingston, Jamaica registered oval postmark, official oval blue "First Transatlantic/Air Mail/Jamaica to Europe/June 1 1939" cachet tying blue/dark blue airmail etiquette. Jamaica dispatches were not accepted until June 1st. 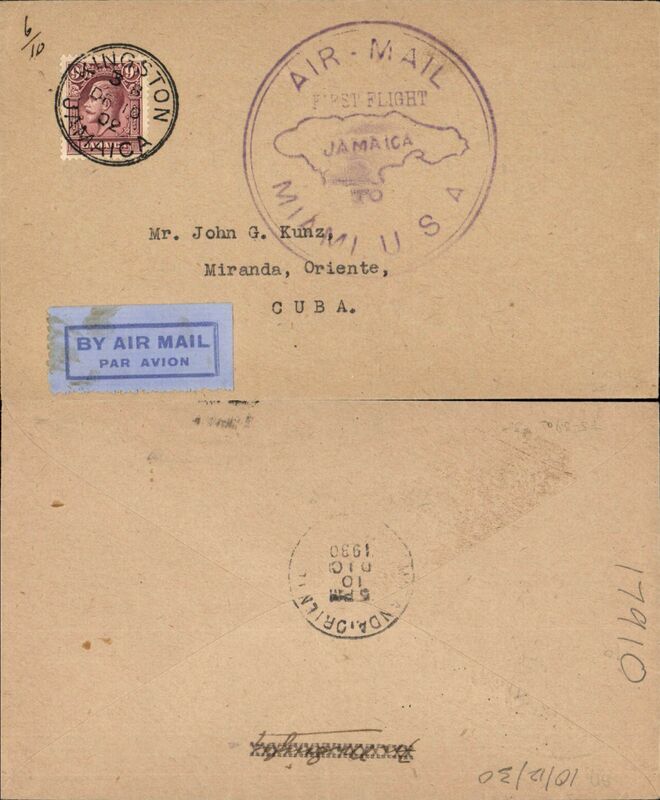 WWII censored air cover flown "All the Way By Air" from Kingston to GB, no arrival ds, airmail cover franked 2 x 1/- (one has perf defects on rh side) + 2d, canc Kingston/Jamaica cds, sealed red/white Jamaica censor tape, also violet '12' in circle Jamaica censor mark. 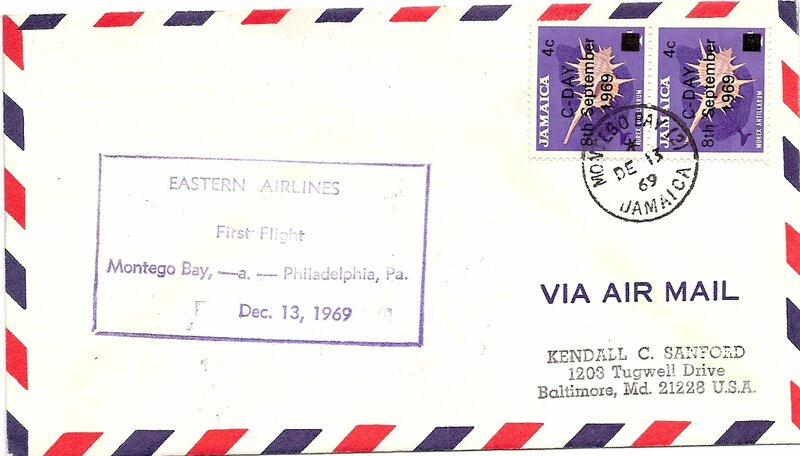 Correctly rated for air to US, air in US to New York, Pan Am FAM 18 to Lisbon, and European airline to GB. 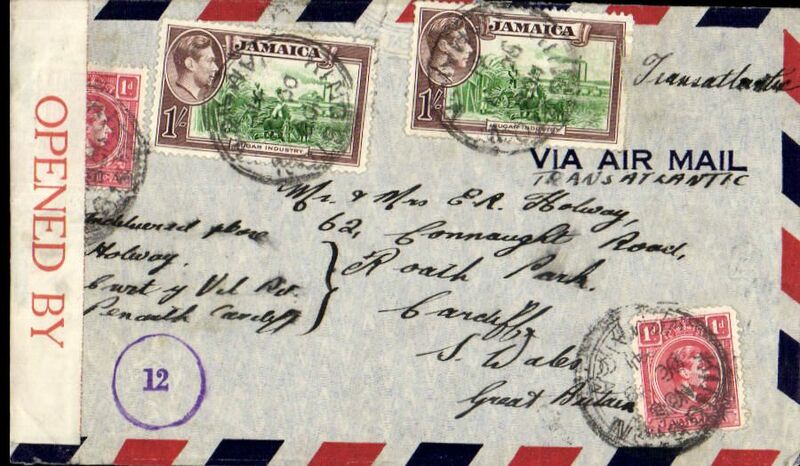 WWII censored airmail from Jamaica is uncommon. 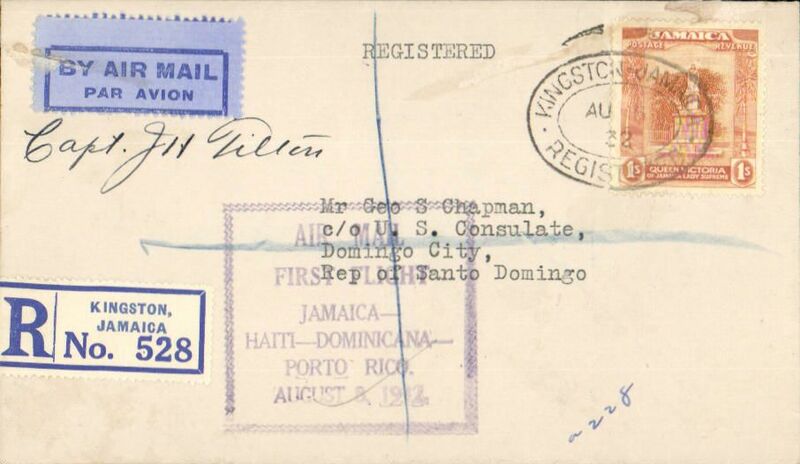 BSAA, Britsh South American Airways, first direct Jamaica-London service via Bermuda, air letter franked 6d, postmarked Mandevile cds, 60% strike violet boxed 'Air Mail/First Flight/Jamaica-London-via Bermuda/Via Speed man' cachet. Believed only 12 flown. 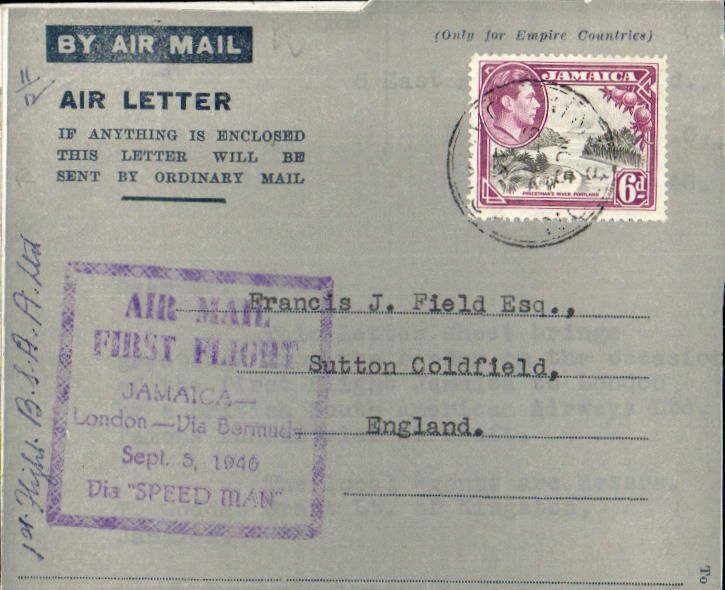 See p22, Beith R.
British South American Airways, first flight, Jamaica to London via Bermuda, no arrival ds, Air Letter 6d rate, square purple cachet "Air Mail/First Flight/Jamaica/London-via Bermuda/Sep 5, 1940/via Speedman", also ms '11/12' suggesting only 12 flown. 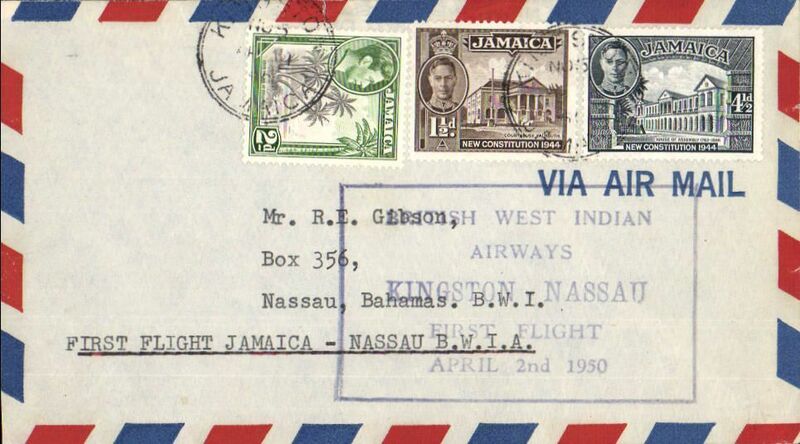 This cover is Illustrated on p22, Beith R.
British West Indian Airways, F/F Kingston to Nassau, no arrival ds, airmail cover franked 8d, large black framed "British West Indian Airways/Kingston-Nassau/First Flight/April 2nd 1950". 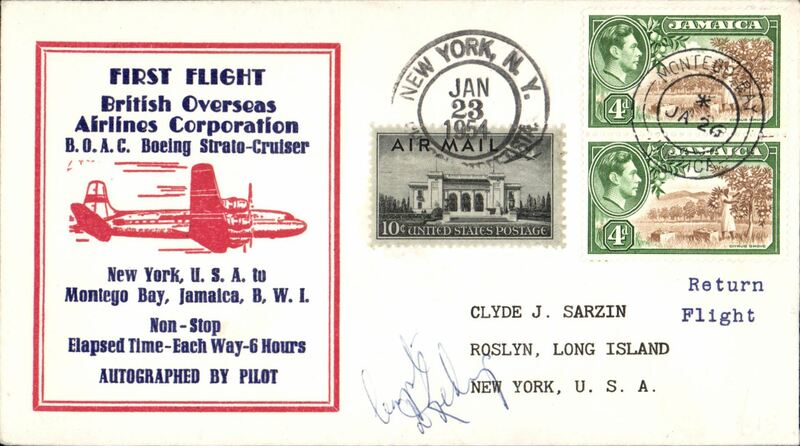 Rare pilot signed F/F BOAC non stop Stratocruiser service, Montego Bay to New York, attractive red/white/blue embossed souvenir cover franked 8d Jamaica stamps canc Montego Bay cds, and US 10c tied by New York cds to confirm arrival. Scarce item in superb condition.